“Know that the Primal Vow of Amida makes no distinction between people young and old, good and evil; only shinjin is essential. For it is the Vow to save the person whose karmic evil is deep and grave and whose blind passions abound. Can you imagine a day going by without complaining? I can’t image this, for each day that goes by I find myself saying, “It’s too cold”, “He talks too much”, “I’m not acknowledged enough”, “He drives to slow”, “She drives too fast”, “My soups not hot enough”. And on and on we monku and deserve the title mokutare, a complainer, someone who grumbles about everything. Not all of us grumble about everything, but most of us will from time to time monku about something or someone. I believe that this is human nature and to monku is really to live. I believe that as Jodoshinshu Buddhists it is important for us to think and reflect on the negative aspects of our selves. I don’t want us to settle into a habit of looking at the negative aspects of the self, but I don’t want us to get comfortable with the positive aspects of the self either. We should look at both and find a balance. 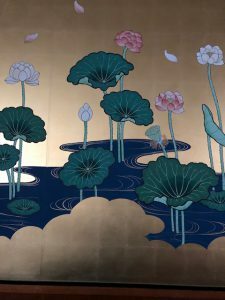 The lotus flowers that adorns our Onaijin is used as a metaphor for the balance found in reflecting on one’s imperfect self. The lotus flower typically grows in stagnant, dirty and muddy water. Out of this muck and mire blooms a beautiful flower untouched by the murky water. The stagnant and mucky water represents the world of imperfection that we live in daily. The complaining, selfish, angry and unforgiving self lives in the world of samsara or in the depths of the murky water. As we reflect on this imperfect self the light of Amida is revealed to us. The more we see the truth of the self the more Amida’s compassionate light shines upon us. Shinran tells us that we are blind to this light because it is covered by the muck and mire of the self. Nevertheless, the light shines upon us. As we continue to monku and run around indulged in the self, sooner or later the Light will reveal itself to us. This is the moment when the lotus begins to appear out of the mud. The person who realizes the one thought-moment of joy. Immediately becoming water of enlightenment. The month of March is the first of two equinox services we observe at our temples. Ohigan literally means the Other Shore. Referring to the shore of Enlightenment, this is the time of year when conditions are ripe for the practice of the Six Paramitas that take us to the other shore. The Six Paramitas are: Dana (Selfless Sharing); Sila (Correct Behavior); Ksanti (Endurance and Patience); Virya (Endeavor or Effort); Dhyana (Meditation); and Prajna (Wisdom). As we stand on this shore of Samsara or delusion we gather at this time of year to praise Amida Buddha (Sanbutsu-e). As we do so we are made to see the harmony in nature at this time of year and search for the harmony within oneself. Amida Buddha is praised has he/she represents the basic harmony of all elements in the universe. 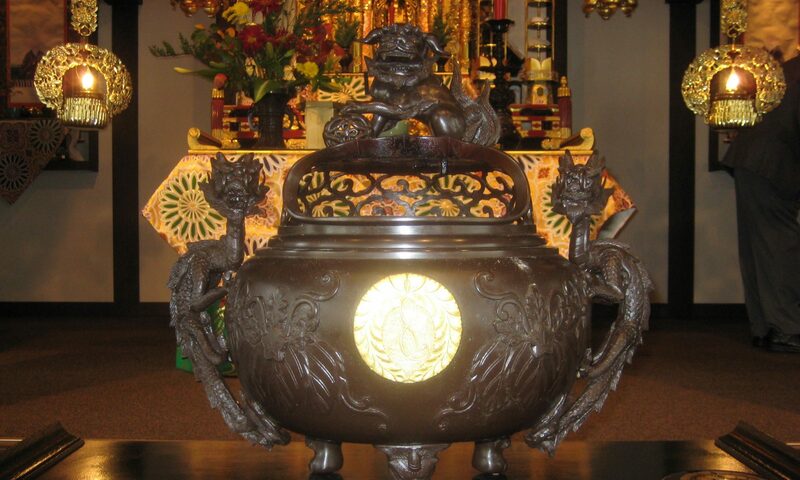 As a Jodoshinshu Buddhist Amida is the manifestation of infinite wisdom and compassion. In gratitude for all that we receive we praise Amida. Our Ohigan service will be on March 17, 2019 at 10:00 am.